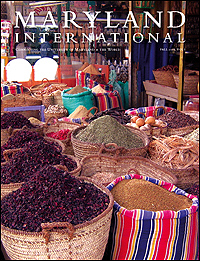 Maryland International, published by the University of Maryland's Office of International Programs, is featuring ISR's Visiting Scholars program in its fall 2008 issue. The Visiting Scholars program is now a decade old! So far, 13 engineers from Toshiba Corp. and 12 engineers from Honda have spent extended periods of time at ISR, working with faculty on projects of mutual interest. ISR customizes each visit to meet the needs of the corporation and the individual visitor. Companies interested in learning more about the program should contact Jeff Coriale, ISR's director for external affairs.